Although its report has its shortcomings, particularly the fact that it didn't identify him as a Democrat for 24 paragraphs (as noted this morning), the Associated Press has at least treated California State Senator Leland Yee's arrest on corruption and gun trafficking charges as a national story, with two bylined reporters and seven others assisting. Not a conspiracy, guys. Just negligence you're attempting to cover up with an obvious falsehood. A search at CNN.com on "state senator" (in quotes) returned over 2,800 results. The quotes matter because a search on "state senator" not in quotes returned over 25,000 results. Feb. 25, 2014 — A web interview with Arizona State Senator Steve Pierce, "a Republican who helped passed the controversial 'religious freedom' bill SB-1062." Feb. 25, 2014 — Arizona State Senator Steve Yarbrough, in an "Uncut interview with SB-1062 sponsor"
April 2012 ("6 New York officials accused in plot to rig mayoral race") — "A New York state senator and a New York City councilman were among six people arrested Tuesday morning on charges that they schemed to fix the city's 2013 mayoral election through fraud, bribery and extortion, according to federal prosecutors." February 2011 ("Immunity prevents arrest of Arizona lawmaker after freeway fight") — "An Arizona state senator involved in an apparent freeway-shoulder scuffle with his girlfriend was not detained because he has immunity from arrest while the legislature is in session, police said." December 2010 ("NY state senator charged with embezzling from nonprofit") — "Outgoing New York state Sen. Pedro Espada Jr. and his son, Pedro, were charged Tuesday with embezzling $500,000 from a federally funded health care nonprofit, according to a statement from the U.S. attorney for the Eastern District of New York." Really, that's enough. Point made. 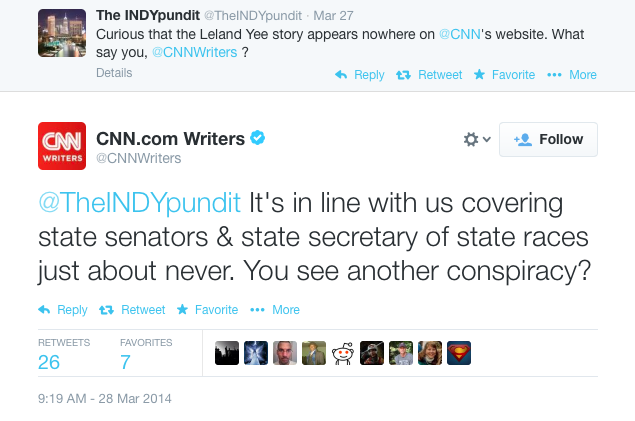 Admit it, "CNN Writers": You're not covering Leland Lee's arrest because you don't want to.